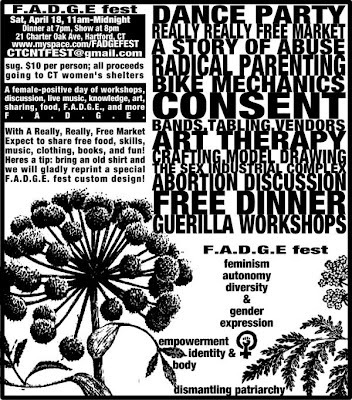 A female-positive day of workshops, discussion, live music, knowledge, art, sharing, food, F.A.D.G.E., and more F.A.D.G.E. There are two workshops to choose from at each time slot unless only one is listed. Workshops last for 50 minutes. Of everything here, I'm especially bummed to have missed Half-Eaten Children. I didn't even think the project was still alive. Do yourself a favor and check out I'm Gonna Be a Diamond Someday on Naitha's Half-Eaten Children MySpace page.